Nal Sarovar bird Santuary is situated about 64 kms from the busy and crowded city of Ahmedabad. It is home to various migratory birds or ‘featheredbiped’ beings as Salim Ali used to call them. Nal Sarovar is situated in a very arid region, and this contrast attracts various birds in the region. The lake is spread over 115 square kilometers and ferry boats are available here which take you across the lake. 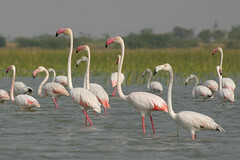 Mainly inhabited by migratory birds in winter and spring, it is the largest wetland bird sanctuary in Gujarat, and one of the largest in India. From a host of regular visitors like kingfishers, egrets, darters, storks, pelicans and flamingos, this place is a safe haven for both bird lovers and over 250 species of birds that visit here every year. The waders or the water birds even nest here at times and if you are lucky you may see nesting sites of purple moorhen, egrets, ducks and teals. Greater flamingoes migrate here from Kutch every year and one can find tall standing birds like painted and blacknecked storks, pelicans (both rosy and white), purple herons and spoonbills watching over the place, like custodians to a declining breed. Many rare birds including the green pigeon, European migratory ruff & reeve, great Indian bustard, Bengal florican and green pigeon are said to have been in and around the lake in the past. Other migratory birds that one can see here are gulls, terns, godwits, ducks and goose, shanks, swifts and swallows. Birds of prey like the ospreys, eagles, sparrow hawks and falcons hover here in search of prey. The bushes across the lake gives refuge to mammals like hares, porcupine and even foxes are spotted here. Those with long bills like whimbrels, curlews, spoonbill (derives its name from its spoon-shaped beak), sandpipers, snipes and kingfishers, cormorants and the darter or snake-bird probe into the details earth in search of food. The best time to visit the place is after October when the water levels have receded to two to five feet in the area and it serves ideal for the aves to visit the place. There have been cases of bird poaching in the area in the past. The migrating Padhars who populate the islands of the lake are also a fast declining tribe. This Bharwad shepherd community are excellent folk singers, dancers and artisans and also make their living here by offering food to visitors and ferrying them around the lake. They are mainly into animal husbandry and visit this lake when the water levels are lower especially during the winter season. By Air: Ahmedabad is the nearest International Airport., Connected to UK, USA and all metro cities in the country. By train: Ahmedabad is also connected by direct train services from Mumbai, Delhi, Banaglore, Goa and Chennai. By road: It likes on the national Highway 8, which connects Mumbai with Delhi.